The women’s golf dress is a stylish and very comfortable option, but very few are seen on the golf course. Why? Well with women coming in so many different shapes and sizes the ‘fit problems’ facing any sportwear designer are magnified, because on top of the golf skirt variables (hips, derrieres, waist) for a golf dress you also have to find the best fit for shoulders, bust etc. all in the one garment. On top of this, the design of any women’s golf apparel, whether golf skirt or dress, has to deal with ages ranging from teens to late sixties. The result unfortunately is that many golf dresses are in the baggy ‘shirt dress’ style – which may tick the comfort box but they’re far from flattering. The other alternative is that they’re made in super stretchy fabric – these golf dresses are likely to be both comfortable and stylish – but at the same time extremely unforgiving on the figure. 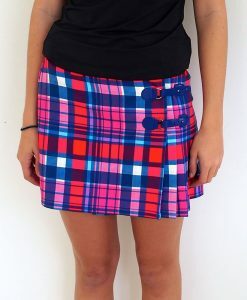 Golf skirts, on the other hand, offer flexibility to mix and match your sizing and fit, so that the overall look is smarter – but that depends on your being able to find the top you like in a colour that matches your favourite skirt or pants. Only when you try to mix a top and bottom from two different brands will you realise just how many variables there can be in terms of colour and tone. Recognising this issue Pohli Women’s Golf Wear uses the same colour pallette in golf tops, golf skirts and pants and golf accessories. Is there a future for the Golf Dress? This entry was posted in Golf Pants/Shorts, Skirts, Women's Golf, Women's Golf Apparel. Bookmark the permalink.